Over time I’ve shared a number of printables on the website. This page includes all the printables currently available for download. These free printables are created strictly for personal use. Please feel free to print, share with family and friends, but do not reproduce these printables online or for sale. The Bill Checklist Template is made to help you track your monthly bills. While online services are great for online bills we all have bills that we have to pay with BillPay, checks, and even cash each month. This template is designed to make it easy for you to input your on information as well as change it as your bills update. Personally I print out 12 of these and put them in a binder in the beginning of the New Year. It helps me stay on track all year long. Download the Bill Checklist Template. The Debt Payoff Tracker allows you to track all your debts in one place. Adjust the debts in order of how you want to pay them off, and update it monthly with your progress. This customizable spreadsheet will make tracking your debt easy, and help you pay it off faster. Download the Debt Payoff Tracker. Since freelance work often means a variety of payment dates this freelance income tracker is key to keeping it all in one place. You can customize this you may add contact info for your client or other information, but this simple template is a good place to start. This comprehensive meal plan will cover you for a full year! It’s a repeating 4 week menu that you can reuse and tweak slightly throughout the year. Need help sorting out who should do what? Have family members who don’t want to do their chores? I’ve got you covered. 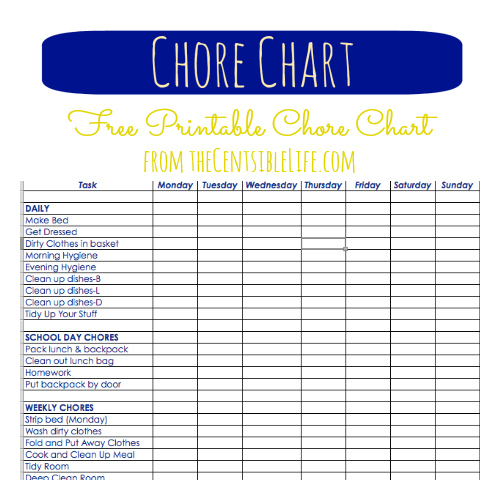 Download the free printable Chore Chart here. Create chore cards for the kids to help them get their chores done without the whining. Download printable and customizable chore cards. More reading: Use Chore Cards to Teach Responsibility. These free printables are created strictly for personal use. Please feel free to print, share with family and friends, but do not reproduce these printables online or for sale.